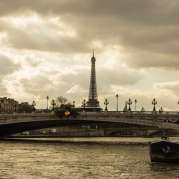 Cruising the Seine is usually a must-do in Paris and can sometimes be a tourist trap. But there is an alternative to big boats’ cruises that would melt anyone’s heart. Some companies propose private small boat’s rides where you are the only ones on the deck sharing a glass of Champagne. The skipper can also stop on-demand and plan to be in front of the Eiffel Tower right at the moment when it begins to sparkle. What a better setting for a kiss? 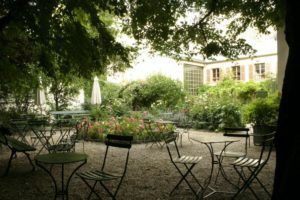 When you stroll in the South Pigalle (the so-called ‘So-Pi’) district in the 9th arrondissement, you will find a private mansion with two artist workshops and a hidden lovely garden. This property is called «Museum of the Romantic life ». Located rue Chaptal, this museum is the former house of Ary Scheffer, a famous French painter. He used to receive there the artistic Parisian elite. From mid-march to mid-October you can have a drink at the garden tea room. A perfect place for lovers in search for intimacy in the heart of a very lively district. 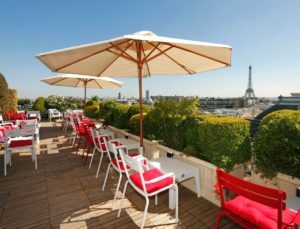 Located avenue Kleber in the elegant 16th arrondissement of Paris, close to the Arc de Triomphe and the Champs-Elysées, the hotel Raphael was the residence of choice of numerous celebrities, French and international. The Terrace of the hotel is one of the refined and intimate places you wish to stay forever. You can have a cocktail or even a fine dinner on the hotel amazing rooftop with its perched garden, enjoying with your loved one a breathtaking view on Paris’ roofs. The Pont des Arts is definitely a ‘must-kiss’ place in Paris and is still known as the lovers’ bridge even if the love locks have now disappeared. It is a pedestrian bridge crossing the river from the French Institute to the Louvre. Many musicians are used to playing on the bridge that create especially at night a ‘Boheme’ atmosphere. Take the time to seat on one of the central wooden benches and let the magic happen. Last but not least, if you feel like exploring the city deeper, you will be able to find many secret courtyards and cobblestones streets in some areas of Paris. 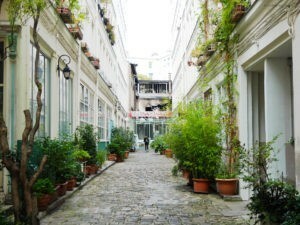 Those narrow and peaceful streets can be found for example in the 14th, the 11th, the 18th or the 20th arrondissements. They used to be artists or craftsmen places of residence and keep today a scent of mystery. They are pretty quiet and charming spots, perfect for a stolen kiss ! 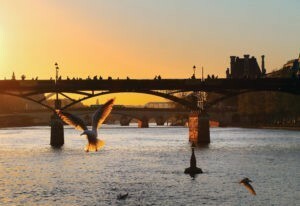 Wish to plan your next vacation in Paris with your loved one ? We will be delighted to help you create the ideal and most romantic itinerary. See already our Paris in Love sample itinerary to get inspired and contact us ! Previous post	« Happy New Year !